In the second pAsuram, AzhwAr says “You should mercifully appear with your beautiful hair, to remove my faitgue”. nANi nannAttalamandhAl irangi oru nAL nI andhO! nAL nal malai pOl sudaRchOdhi mudi sEr senni ammAnE! Oh swAmi who is having divine head along with radiant hair having rays like a great blue-gem like fresh, attractive mountain having a dark sun appearing and starting from it! After looking out and calling out repeatedly saying “you should come to be seen by me”, my eyes and mouth dried up, and feeling ashamed in this place where everyone is having his/her wish fulfilled, even if I who have SEshathvam as my identity, become anguished, you are not coming one day and showing your mercy to give me the benefit of seeing you. Alas! kANa vArAy enRu enRu – AzhwAr is not of the nature to remain peaceful if emperumAn does not appear after calling out once saying “kANa vArAy“; he will repeatedly say “kANa vArAy, kANa vArAy“. kANNum vAyum thuvarndhu – Since AzhwAr does not know as to from where emperumAn will come, he looks at every direction and gets his eyes to dry up. He has even crossed the stage as said in thiruvAimozhi 7.2.1 “kaNNa nIr kaigaLAl iRaikkum” (removing the tears with her hands). His mouth too dried up by calling out repeatedly. adiyEn nANi – I who have the relationship with emperumAn to feel ashamed for emperumAn’s defects considering them to be our own, felt ashamed. Feeling ashamed thinking as to what the townspeople will say about him [for not coming]; alternate explanation – instead of calling out to seek other benefits, AzhwAr called out to see emperumAn, which is the proper attitude; for such state of AzhwAr, emperumAn’s act was good [i.e. viparItha lakshaNA (sarcasm) – he acted improperly by not showing himself] – AzhwAr thought about that and felt ashamed. nal nAdu – Three meanings. viparItha lakshaNA (sarcasm) – the abode which is filled with endless sorrow. piLLAn explains “this is the abode where one can attain emperumAn and enjoy; if not why would they [AzhwArs and other devotees] called for him. alamandhAl – If I become anguished. irangi – Even if you don’t have interest, should you not show your mercy seeing other’s suffering? Don’t you even have the compassion which the rishis [like vAlmeeki] had? oru nAL – Am I asking you to come for many days? nI – You who are having distinguished nature to be constantly seen. andhO – You neither understand your greatness nor my suffering! kANa vArAy – Am I calling you seeking other benefits? karu nAyiRu udhikkum – rising of the dark sun. karu mANikka nAL nal malai pOl – The mountain from where such sun rises from. Like a mountain made of bluish expensive gem. nAL nal malai – Like a “nAtpU” (fresh flower), fresh, attractive mountain. Should be recited as “karu mANikkam – nan malai mEl – karu nAyiRu udhikkum – pozhudhu – pOl – mudi sEr senni ammAn“. nAL – pozhudhu (time). sudar sOdhi mudi – Very radiant hair. In line with the simile “karu nAyiRu udhikkum“, mudi here means hair [generally, mudi means crown]. sEr senni – The divine form on which the hair rests, appears like a mountain of gem. ammAnE – Oh sarvESvara! When a samsAri [bound soul] becomes a mukthAthmA [liberated soul], to remove his sorrow, emperumAn manifests his divine hair to him [mukthAthmA]. It is said “kESava: klESa nASana:” (kESava is the one who destroys the sorrows). 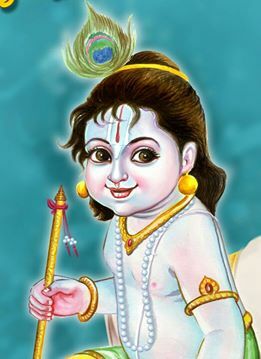 This entry was posted in thiruvAimozhi, thiruvAimozhi 8th centum on March 19, 2019 by Sarathy Thothathri.